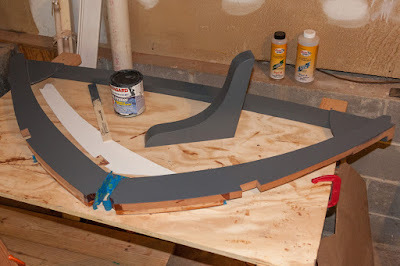 I almost titled this post "Fifty Coats of Grey," due to all the sanding and re-coating I've been doing. But, I decided not to. Maybe next time. Work continues, slowly, on the Zip. I have been applying Aquagard 190 primer to the transom knee and frame #5-1/2. Frame #5-1/2 with notches cut, poster board template, and my modified 2"-wide transom knee. When I originally constructed frame #5-1/2, I had intentionally left the notches for the sheer and chines uncut. Some builders prefer to only notch the frames once they are all mounted on the construction form, and the longitudinals are sprung. I decided that those people are better woodworkers than I am. 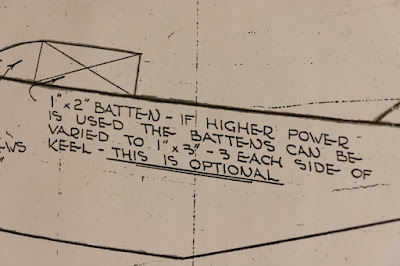 I also decided that, since the Zip has been a popular boat to build ever since it was introduced 63 years ago, in 1954, that the notch locations shown on the plans are probably accurate enough. In all that time, there don't seem to be many well-documented complaints. Good enough for me. I have already cut these notches in the other frames and the transom. To "retro-fit" them into frame 5-1/2, I drew a template from the plans onto a piece of poster board. Then I simply placed the template on the frame, marked, and cut. The floor batten notches remain uncut on all frames, however. I still have not decided if I will use 3 per side, or only 2. 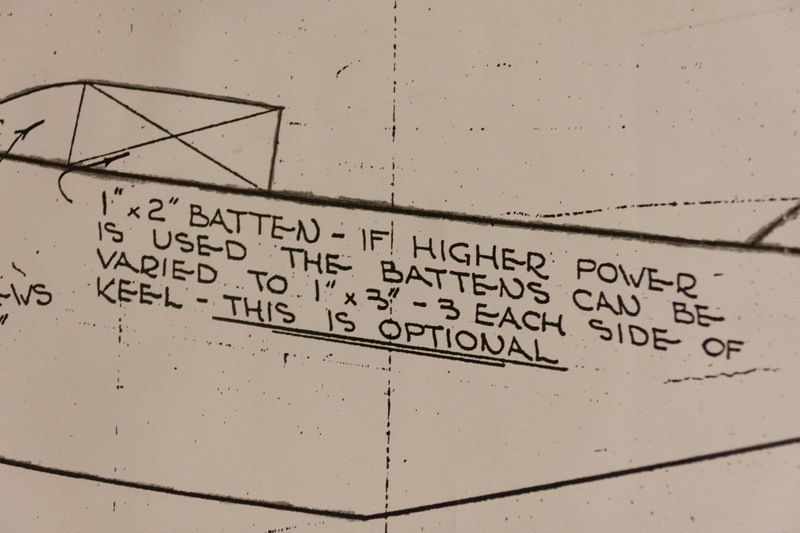 Tucked away on one of the plan sheets is this statement where Glen mentions the option of using 3 floor battens on each side of the keel.